Our daughter-in-law Cindy's mother and sister live in Amarillo and we were able to connect and meet for dinner. It has been 16 years since we last saw each other at Eric and Cindy's wedding. 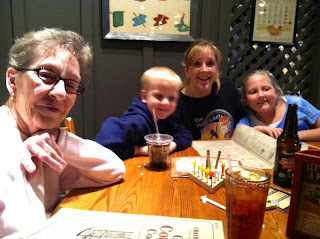 We met Melva,Kathy and Kathy's two children Elizabeth and Matthew at Cracker Barrel. The gift shop is awesome, but expensive. Fun to browse. Kathy said when they have a sale, the markdown is very good. After a nice dinner and conversation,we said our goodby.It was good visiting with them and to catch up on 16 years.